Highway Wheelie Crash: Wird beim wheelen Scheiss gebaut, es dich auf die Schnauze haut. INCREDIBLE Motorycle Wheelie Fail 2016 Stunt Bike Crashes Doing Street Bike Stunts Gone Wrong Caught On Camera Epic Fail Motorcycle Wheelie Crash 2016! Watch as extreme freestyle motorcycle stunt rider crashes riding wheelies on the highway at high speed in epic wheelie fail 2016 video caught on tape. 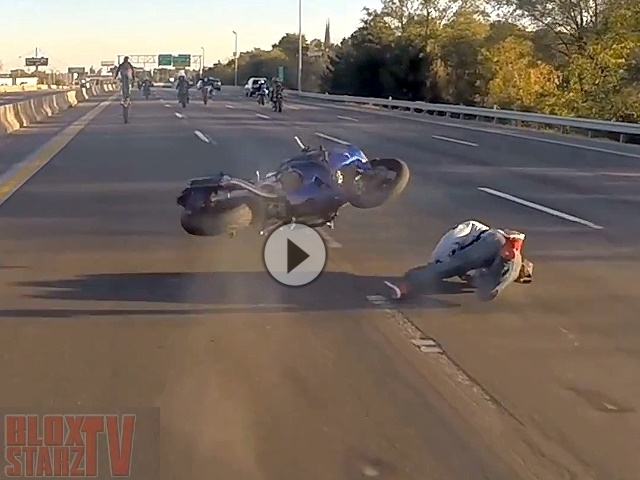 Watch as motorcycle wheelie gone wrong results in big bike accident on freeway in Saint Louis, MO during huge motorcycle stunt street ride. Motorcycle wrecks while riding wheelie causing epic fail street bike crash on freeway causing motorcycle to flip muliple times an cart wheel flipping stunt bike end over end in burtal motorcycle accident at high speeds. Motorcyclist crashes while wheeling looping out motorbike in horrific motorcycle wreck. The make an model of motorcycle shown crashing in this video clip is a 2003 to 2004 Kawaski Ninja ZX636, 636, or Kawasaki Ninja ZX6R sport bike set up for performing motorcycle stunts on the streets, highways, & roads.